PFD or Personal Floatation Device. This accessory is a vital purchase, not to mention a Coast Guard requirement. Jackets should be tested yearly for buoyancy and replaced if needed. Although you may not be required to wear a life jacket while paddling, you must have easy access to one. All life jackets must be Coast Guard approved in order to stay within regulations. Your PFD can also double as a landing pad for tools or a seat cushion. Assorted Electronics and Mounts. All mounts are designed to maximize your fishing experience and there are endless options for electronic mounts. These mounts allow you to fully customize your kayak with GPS units, GoPro units, fish finders, camera holders, and much more. Fish Bags or Soft Side Coolers. Most fish bags are angular shaped to fit on the bow of your kayak. This low-profile shape keeps your catch as fresh as possible and is ideal for separating your catch from your food items. Traditional rigid coolers can weigh down your kayak and in some cases act as a sail putting you off your fishing spot. Rod Holders. To have a fishing kayak, it must have rod holders. Some fishing kayaks offer built in rod holders as a standard feature. Additionally, there are many aftermarket brands that offer rod holders as accessories. Some rod holders are flush mounted, meaning you must cut in to your kayak to mount the holder, while others are attached using a rail system. Both types are tried and true and this is ultimately a fishing style choice. 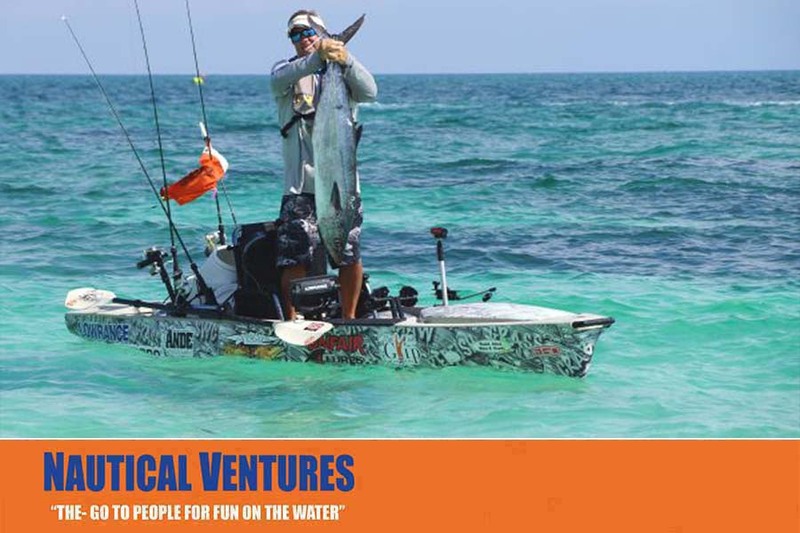 When it comes to fishing kayak accessories in Palm Beach and Fort Lauderdale, Nautical Ventures has been serving the South Florida market for over 30 years. They’ve been helping kayakers in Palm Beach County, Martin County, Broward County and Dade County get on the water to enjoy trouble-free kayaking. Remember… you’re not just buying kayak accessories - you’re buying the experience.